Here in the Pocono Mountains we have some of the most Beautiful Homes you may ever come across. Some of these homes come with a great price as well. The Traditional Mountain Chalet is a big part of what makes Pocono Mountain Home Buying so unique and wonderful. 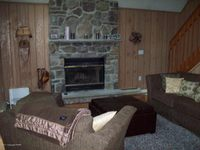 This one of a kind Chalet is located in North Pocono in one of the most amenity rich communities through the Poconos known as Big Bass Lake. This home is a true Mountain Home. This home features ceramic , wall to wall carpet , vinyl exterior, fully finished basement, living room dining room combo, brand new kitchen, cathedral, pellet stove, stone faced fireplace, and a large deck with screen windows and storm doors. 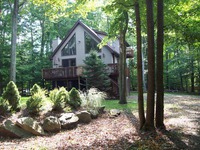 This is a perfect all 4 season Pocono Mountain Home for sure. 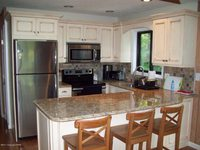 Appliances include clothes washer, refrigerator, electric oven, dryer, and dishwasher. Can you get any better then a 5 bedroom, 3 bathroom , 1,787 square foot Quintessential Mountain Chalet for $199,000?! This one surely won't last long on the market! Big Bass Lake is a Beautiful, Private, Lake Community Conveniently located close to Route 380. It is in between Tobyhanna and Scranton Pa. Big Bass Lake is everything you could possibly want in Leisure Living.Winter, there is Ice fishing and Ice Skating Available if the weather permits. A Perfect Mountain Stream where the Trout Fish are always biting for the fishermen! There are also Fully Equipped playground facilities, picnic areas, and six professional Laykoid surface Tennis Courts. Big Bass Lake offers you two top notch Recreational Centers all year round! One has a beautiful indoor pool, coffee shop and snack bar, an expansive view of the private ski slope and "T" bar, sauna, game room including billards table and ski shop. The other recreation center adjoins the large heated outdoor swimming pool, tennis courts and basketball court and contains the tennis pro shop, locker rooms, game rooms and facilities for major adult social functions. There is a Ski Hill with T Bar, Tubing Hill, indoor and outdoor pools, dry sauna, and a Clubhouse. The Snow is Finally Here in the Poconos! A Holiday Tradition in Stroudsburg! Hot Shows Storming into the Poconos! Ski Season Coming Soon at Big Boulder! The Classic Beer Festival at Split Rock Resort! Holiday Event in the Pocono Mountains! Ski Season in the Poconos is Coming Soon!